It is a busy week! Labor day weekend at the book festival was a blast! Thank you to everyone at the Decatur Book Festival for having me, and Emory Alumni for hosting me as well. Thank you to all the kind people who came to listen to me and buy books! Yesterday an article about mental illness that I wrote was posted on KevinMD (it is found permanently as part of this website in the Schizophrenia section. Tomorrow, I will be live on @WardandAl SiriusXM Ch167 from 1:40p to 2:00p tomorrow September 14th promoting my new book Schizo. Come listen! And Wednesday September 15th is my official book launch. I know you have been able to get early copies through amazon pre-order (Thank you for those that pre-ordered! ), but now it will be available everywhere! Book stores, Walmart, all online bookstores like B&N. Everywhere! If you haven't read it yet, please pick up a copy. Next week! That is next Saturday, I am going to be doing two separate events for the Decatur Book Festival. First, at 11am I will be on the Thriller Panel located in the Decatur City Hall. Afterwards, there will be a book signing. I will then move to the Emory Tent, and spend the rest of the afternoon there for a meet the author table. Kindle available Sept 15, Audible available now. I am sorry for not posting sooner, but I was on an incredible vacation - which I will talk about in a post later this week. Right now, I have to update you that a few days ago (while I was away), my Audible and iTunes versions of my book Schizo went live! Narrated by Will Tulin, the audiobook is ready now! Please, please, please leave a review on Amazon/Audible and on iTunes. It helps me so much! As a thank you, the first person to share my facebook announcement will receive a free copy of the digital version from audible. If you are an official book reviewer, I can send you a link as well. Also, as an update, I will be speaking as an Atlanta Writers Club track member for the Decatur Book Festival, and recently have been asked to appear in the Emory Alumnae tent as well. Both on the same day. From 11am-2pm I will do the AWC track speaking time and book signing, and then afterwards I will go to the Emory tent. AND, Emory has included me on their full paged ad in the AJC they will be placing soon! Please check me out on Bloglovin.com - click on the above or search www.TheSchizoSeries.com on the site. The mentally ill are more than just a few people locked away in an institution; they are all of us. Our mothers and fathers, our sisters and brothers, our children, our close friends, and often ourselves have some form of mental illness. In other words, the broken mental health system affects all of us. First, here is a quick chart popout that will summarize some things that this bill does. Our mental health care system is in crisis. Hospital beds for psychiatric care have sharply declined and many mentally ill end up homeless or incarcerated. In the above, I advocate a top-down approach. Eliminate block grants and dedicate the 200 billion(!) in funds to go where they are needed. What I like about H.R. 2646, besides the fact it is a rare bipartisan bill, is it makes sense. Eliminate the politics and use evidence based medicine (EBM) approaches to funnel money where it is most needed and will do the most good. The rest is commentary. OK, a lot more than commentary, but the bill creates an Assistant Secretary for Mental Health and Substance Abuse disorders with a lot of responsibilities to set policy based on EBM and sound science. My two biggest concerns is that the privacy laws still do not allow for relatives to be part of the process if the patient refuses to let them in. Also, that there is no provision to eliminate the block grants as funding for mental health. Why is this important? Block grants are large amounts of money given to states to be used for many purposes. States have the flexibility as to how it will be spent. What often happens is that the monies get siphoned off for the largest budgetary problems for each state, and not necessarily used for the intended purpose. By making mental health funds a categorical grant, it would allow the new assistant secretary to funnel the funds exactly where they need to be. And no budgetary priorities counter to that could alter that path. A very helpful website for these legislative issues is Mental Health Policy Org. Please check this out and be more vocal in supporting these efforts. Also, props to House Representative and Congressman Tim Murphy for pushing this bill, and finally getting it to advance. There is much further to go in the process, but with enough support, I believe it can happen. For those of you who are not aware, there are many ways to get reviews. Bloggers are a great resource. And I have previously posted reviews from Readers Favorite—also a wonderful site. I have been fortunate so far to have three five-star reviews, plus a number of very favorable recommendations. But all of these are small potatoes compared with a Kirkus. There are so many people whose author careers are made or broken from a Kirkus review. Their rep is that they are more stingy in giving praise. You will often see quotes like this on a book: "...exciting ride..." with the moniker of Kirkus next to it. Authors and publishers want something quotable. "The story smoothly alternates between present day and past, generating suspense..."
And another, that is particularly interesting, since Kirkus had no idea that my next book focuses on the very character they praise: "Characters are engaging all around, with Jake a standout." Oh, and by the way, I have a giveaway on Goodreads that is happening right now! You can get a free signed copy and some extra swag. Enter now before it closes on the 15th. After BEA, my husband and I met up, shared my favorite wine "Whitehaven" and enjoyed the view (and the last of the nice weather). My favorite Chicago building. I used to think this was the best Chicago view. But we were informed that was at Cité because it has the Hancock in its view. Next time, Chicago. Sometime soon. I went to the Signature Room for Brunch for both the view and a wonderful reunion with one of my favorite (and still teaching!) professors from med school. I met his wife for the first time--such a wonderful woman. It was a great morning. And it did not end! The professor and his wife had a membership to the Art Institute, and decided to join us there as well. Seth and I had a delightful time visiting the familiar art, and the new modern wing that I had not seen since it was built after my time in med school. All of this happened because of our marital mishap. It's all good. Or all right (Wright)? We'll get there. More reunions commenced at Lawry's (The place for prime rib!) with an old friend from med school. I did not count how many years it had been since we'd seen each other because it does not seem possible! She has not aged at all. Thanks to a very flexible Airbnb host, my husband and I could go on an architectural tour of Oak Park. With many pictures above. My husband is an architect and though I had already been on this house tour, it was nice to see it through his eyes. I included a small sample of the photos in the slideshow above. Frankly, Oak Park might be one of the most picturesque communities in the country. I live in a neighborhood that is full of nice craftsmans. But it is nothing compared to Oak Park. Victorians are the "abhorrent" buildings that Wright could not stand to look at. I love them. I love the Wright-designed homes. Most are restored and beautiful. Between Oak Park, and the skyscrapers old and new, Chicago is certainly an architectural masterpiece. I had a great visit for work and pleasure. I know I'll be back to Chi-town. I look forward to it. I am back from BEA and completely exhausted. It has been awhile since I last visted Chi-town, and it is as beautiful as ever. The magnificent architecture has only gotten better with the addition of many new skyscrapers. I could see all of them from my apartment (see pic with wine) that I rented via Airbnb. Across the street from McCormick Convention Center, on the 28th floor, and on a corner, I really enjoyed the view. Back to why I was there. Books! My book! This was the first time I got to greet her, my first fiction novel. Even though I have published before, there is nothing better than holding your multiple years of hard work as a finished product. But the moment is fleeting because my job was not to ogle my book. Or collect ARCs (advanced review copies) from others. I am there to sell, sell! Prior to arriving, I was definitely nervous. I had prepared well, memorizing a few versions of my logline (one minute/elevator pitch) to give to people. I printed out a few hundred microfiber cloths with the image of my book with link to pre-order. However, while I can talk your ear off if you are not careful, I am not great at meeting strangers. Oh, and there was the whole sprained ankle issue I was dealing with too (previous post). Fortunately, my ankle had progressed well, and I did not bring my crutches to Chicago. One of my co-author colleagues at Waldorf Publishing, Nic Schuck, gave me the idea of taking the give-away totes, and fill them with our book as well as the standard book list. Then ask for their card while you are selling them on your book. In the beginning, a tote is like gold; it can hold a lot of free books. Since people wanted one, it was a nice ice breaker to go into my shpiel. I could see what worked and what did not, and I could hone the speech. I found my stride at BEA. When the totes were not in as much demand, I started giving out my cloths. Having experience at BEA about 5 years ago, I saw the kinds of giveaways that were popular and unpopular. I noticed that in the beginning, you want free books. But eventually, you have to carry them around, and you simply stop. I thought of something small and light, that could advertise my book Schizo, that people would actually want. I did research and found that the cloths were reasonably priced. And frankly, I use them myself. It worked. I could snag someone who was not at all interested in our booth, offer them a cloth, and have them stop while I quickly gave my shpiel. More importantly, I met a lot of people and felt like I truly connected. I even had a fan who found out about my book the previous day and waited for me to arrive so she could meet me and get an autograph! My first fan (other than my husband who technically gets that honor). I hope the bloggers and book sellers and librarians liked what they saw, so my launch in September is successful. After the convention, my husband met me in Chicago and the vacation part of our trip began. He bought my favorite wine and we enjoyed the bottle while staring out at the amazing view (see gallery photo). Our dinner reservations at the Little Goat Diner fell through due to flooding, and was rescheduled to Sunday. No problem! Lord knows there are a ton of great restaurants to choose from. After dinner we tried to find a donut shop, but nothing in that area seemed to be open past 9pm, so with the cold rain beating down on us, we gave up and enjoyed the city view from our rented apartment. That was when we had a great husband-wife moment: I asked, "Did you bring a printed copy of our cubs tickets for tomorrow?" He said, "I did not because I did not buy the tickets. I thought you did," I responded. "No, we talked about it. You definitely bought them. I know I did not. We talked about where they were located. You got them." Hmmm. We searched and searched and there was nothing purchased. But tickets were still available. We looked at the frigid weather planned for the next day, and decided it was best to do something inside. Best mistake ever! We opted for the Art Museum. It has a new modern art wing that was built after my time there in med school was over. I loooove modern art. And I hate the cold. So our mistake was a win-win. What is BEA? For anyone not in the publishing industry, BEA stands for Book Expo America, and it is THE place to check out whatever is new in books. 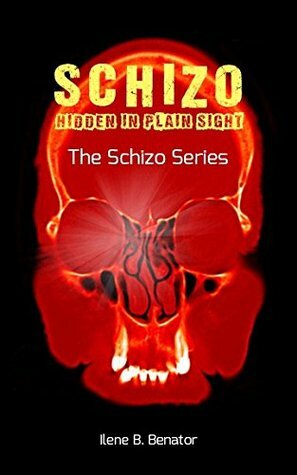 I am going there to promote my new book Schizo: Hidden in Plain Sight. You can find out more by clicking around my website, but in short, it is about a med student who is on his psychiatry rotation and encounters a schizophrenic patient whose bizarre ramblings about a plot to control the population might actually be real, and his pursuit of the truth puts him in grave peril. In case you thought my bio listing "soccer mom" was cliche, I played in the parents vs kids game. For some background info -- I'm a clutz who loves to play sports. I am surprisingly good at many different sports, but have managed many injuries in the process. As a kid, I played soccer, but I just could not keep my feet. My head knows where to go, but my feet get tangled. And so, my past experiences got realized, and my foot got caught and twisted and popped and now I have a severely sprained ankle. (I considered attaching a photo, but it is pretty tough to look at for the non-medical readers out there). While I can now walk without crutches, I cannot guarantee that I can maintain walking at the convention as needed, so I will try to stay off my foot as much as possible. So if you see a girl with an orange backpack hobbling around with or without crutches, that's me. Ask me for a microfiber cloth, or a bookmark. At my booth, I'll sign an ARC for you. I'll be at the Waldorf Publishing booth #2225. I hope to see you there! I will blog each day, and tweet from @ibbenator about anything I see that is cool, interesting, and/or free. Also, for those who are visiting Chicago for BEA and need some suggestions, I have a section on my website about that. In "About," since I lived in Chicago for med school and it is a major setting in my book. I am excited to announce the launch of my website. Of course, if you click on that link, it will send you to the home page of this new website. If you are not careful, you will create a paradox. However, unlike 12 Monkeys, I do not think there will be an explosion as the paradox is realized. I believe that time paradoxes don't exist, since the future you meeting the past you are a completely different entity. You can talk to yourself since you have set yourself upon a new timeline. As you can tell, I like science. And science fiction. This blog will have that. Sometimes medical science will find a home here. If it is purely healthcare related, the blog might end up on my old blog drbrenner.blogspot.com. I might repost a particularly useful article from that blog here. There were a few helpful blogs from Goodreads that I might repost as well. In the next week or so, there will be some great guest posts beginning. If you think you would like to do one, send me a message via the Contact page.